Friends of IIASA, a 501(c)3 organization, can receive contributions from U.S. taxpayers who wish to support education and research activities at IIASA. Please select a category below to which your donation should be applied, and you will be redirected to the Friends of IIASA PayPal site. On this site, there is also an option to pay directly with a credit card. Checks may be made payable to the Friends of IIASA. Please indicate on the MEMO line which fund you would like to support. 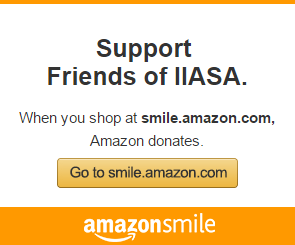 Choose Friends of IIASA as your selected charity on Amazon Smile and 0.5% of every dollar you spend will be donated to support innovative research at IIASA, at no cost to you! The Friends of IIASA Form 990 is available upon request to the treasurer of the Friends of IIASA Board of Directors.